With 8 fairly evenly matched teams taking part in this year’s Friendship Division, any number of teams had a reason to believe that this year might be their year. The big favorites heading into the Tourney were two squads based out of the Big Apple- the ageless NY Rockits Alumni (2006 Friendship Champions, who had also added a few younger bodies to provide a spark), and NY AA (a new squad featuring talented vets from all over), as these two teams featured many players who had previously competed in the Men’s Open division, and could still produce decent stats in the upper divisions. Right on their heels were some solid veteran teams such as the Montreal Kaitas (2008 Open Runners Up), the Philly Suns B (2008 Friendship Runners Up), Toronto CCYAA (starring a few of the players from the 2008 Champion Toronto Sliders), and the revamped but always steady NJ Raging Demons. 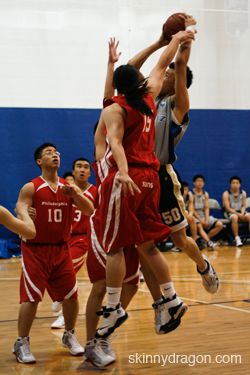 Finally, there were two brand new teams that were making their first appearance in the Chinese Nationals at the Men’s level- the Philly Suns C and the NY ISS Flights Men. These young and inexperienced teams had rosters overflowing with speed and athleticism, and could be dangerous opponents if they weren’t rattled by the pressure of the big stage. Pool play turned out somewhat as expected, with AA and the Rockits Alumni (average margin of victory at 32 pts) grabbing the top 2 seeds overall with undefeated round robin records. In the Quarterfinals, NY AA would draw the Toronto CCYAA Friendship team. Toronto’s Francis Chow (2.0 3pg, 14 pts) continued his spectacular outside shooting just as he had all tourney long, and it appeared that the 830am start time may have been too early for AA and their weeklong party binge. Toronto was playing well and was ready to make some noise, but all the commotion must have woken up NY as AA arose from their stupor and took care of the job, advancing 58-39. 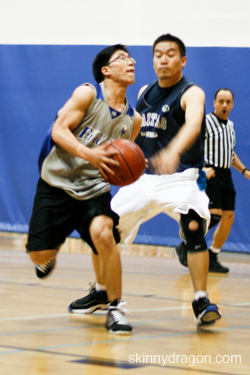 Joe Yen tallied 8 points, and San Mac dropped in 11 for AA. When the Suns C met the NY ISS Flights, it would be a matchup of the 2 quickest teams in the division. Many of these players had grown up playing against each other in Juniors competition, so these 2 teams had a pretty good idea of what to expect. The Suns C would play Run & Gun and press full court at every opportunity. The Flights would counter with their own trapping defense and run their offense through their tower of power, All-NACBA pick George Tang. The game began and neither team could really put points on the board, as each team was forcing the other to hit an outside shot. About 8 minutes into the game, the game started to turn into the trapping and running style that everyone expected. 6th man Tuan Tang (12 pts, 4 rebs, 3 assists) came in for Philly, netting 12 points in the first half- as he scored on left handed and right handed drives to the bucket. The Suns looked like they might be able to pull away quickly, but new guy William Moy (14 pts, 4 triples) sank 2 key buckets and William Hu (9 pts, 7-8 ft) rifled in 3 straight ft’s after being fouled on a 3-point attempt for ISS. The score was 19-12 at the half in favor of Philly. In the second half, Moy’s hot hand kept torching the nets as he was getting free for deep jays. But in the end, the deeper Philly bench pushed them to a 40-30 win. Meanwhile, on the Main Court, it was the NY Rockits Alumni taking on the Montreal Kaitas. The Kaitas had gotten to the gym extra early, and it showed in the beginning, as Johnson Ku (15 pts, 2-2 ft) and Mike Mei were able to put decent stats in the book. But on defense, the only thing the shorthanded Kaitas (6 players) could do against the deeper, taller, and stronger Rockits was to play a zone. The Rockits always found the open man and kept pounding the boards for easy deuces as Victor Tang (14 pts, 2-3 ft) and Ed Chan (8 pts) went unchallenged in the battle for interior supremacy. The Rockits won 40-24. The last game of the QF round was a matchup of 2 veteran laden teams from the East Coast Asian Circuit, as the Suns B and the NJ Raging Demons met up. Eden Chuang (7 pts, 1 trey), Gregory Goon (11 pts), and John Hsu (All-Tourney, 2.7 3pg) were the big 3 for Jersey in the first half, while Liken Fung (14 pts, 2 treys, All-Tourney) and dynamic Jimmy Huynh (6 pts, 29 to watch) were doing it for Philly. The Raging Demons were controlling the paint on defense, and forcing the Suns to make tough contested midrange or deep shots. But on offense, Gregory Goon just couldn’t hit his free throws (0-3 in the first half) and NJ’s 6 turnovers gave Philly a 19-14 edge. After the break, lefty stroker Liken Fung broke the game open by hitting 2 three point shots, and then B team held off the Demon surge at the end 40-34, despite hitting only 8-17 ft’s after the break.